A perfect solution for any healthcare provider, RADinfo SYSTEMS intelligent Micro PowerPACS integrates with any vendor's modality to provide a seamless digital environment. This powerful combination is the one stop cost saving and film-less solution for users to Acquire, Archive, View, Distribute and Manage DICOM images. The unique design of Micro PowerPACS will fit seamlessly into the workflow of your facility. It is proven to enhance productivity and provide enormous improvements in patient throughput, diagnosis and treatment. This compact yet powerful "micro-PACS" is fully scalable to an enterprise wide PACS as your facility grows. 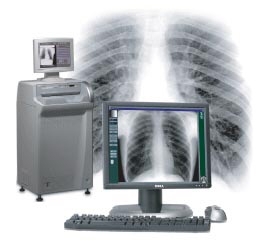 The Micro PowerPACS communicates directly with any modality to acquire DICOM images. It also supports a DICOM modality worklist to register or retrieve patient demographic information from your RIS/HIS to save time and ultimately reduces costly human errors.